Can I just whine for a minute? I am so freaking exhausted! Darcy is having some sort of morphed cold/teething thing that is waking her up at all hours of the night and getting her up at 5:45 in the morning. Now, I have no idea how she knows it is 5:45, but she wakes up at that time as if she has an alarm clock. I think I'm off to get some coffee and a nice muffin and try to pretend my day is just starting now! Nicole of Another One Bites the Crust made a vegan version of Rachael's Asparagus Carbonara from BOB. Cristin at Self Magazine's Eat Like Me used Rachael's recipe for Three Vegetables Penne with Tarragon-Basil Pesto as the inspiration for her own pesto dish. 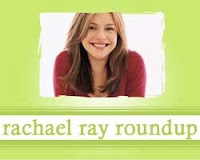 Gayle Dishes features a discussion of two Rachael Ray egg recipes: Nested Eggs and Croissant Egg Boats. Nicole at Another One Bites the Crust is back with a review of Rachael's Cold Peanut Satay Noodles. Katie at Notes from the Kitchen Sink also tried Rach's Cold Peanut Satay Noodles. Mike at Endless Simmer is not pleased with Rachael's recipe for Wild Mushroom Broken Spaghetti Risotto with Arugula and Hazelnuts. Jaime of Embracing Balance made Chicken & Biscuit from BOB. Sara of I Like to Cook had two hits and one miss when she made Pretzel Crusted Chicken and Zucchini Strips and BLT Salad. Jennifer at For Sarah made Rachael's recipe for Creamy Spaghetti with Beans and Bacon a bit more figure friendly.